This Faithfull Triangular Sanding Pad has a micro hook and loop fastening system. It is used in conj.. 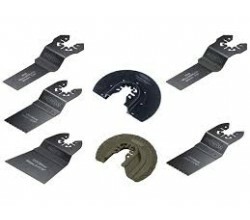 These Faithfull Multi-Functional Tool Flush Wood/Metal Blades have HSS wavy set teeth that make it i.. The HSS wavy set teeth on this Faithfull bi-metal blade make it ideal for sawing wood, copper and al.. This Faithfull saw blade has a broad range of applications with its carbide grit edge. It will cut o.. This Faithfull saw blade has a broad range of applications with side set, hardened teeth, for fine s.. This Faithfull radial saw blade has a broad range of applications and is ideal for flush and plunge .. This Faithfull diamond boot blade will remove tough grout from between tiled surfaces. Its efficient.. This Faithfull flexible scraper is ideal for removing soft carpet adhesive residues, paint, silicone..